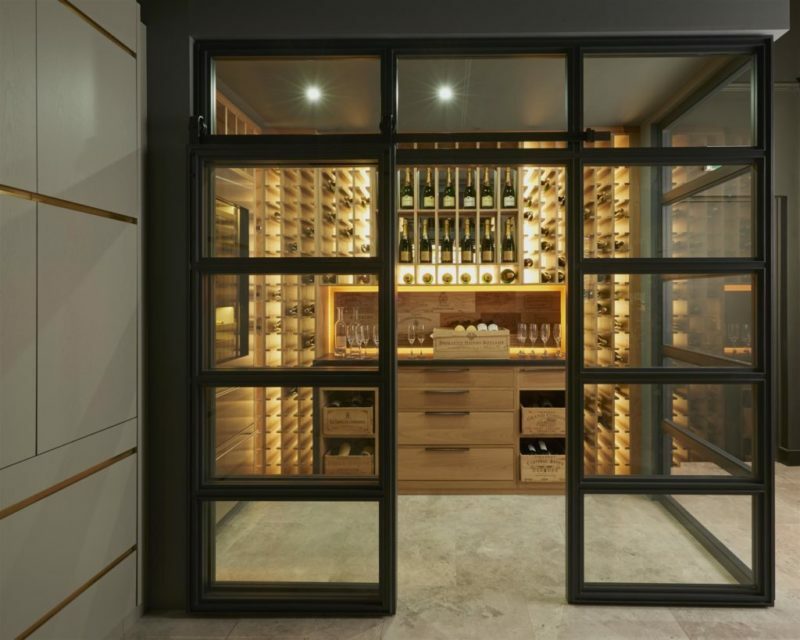 Once often dark, damp and uninviting spaces refined to cellars and basements, wine rooms are now fast becoming an integral feature area of the home and a welcome space for entertaining guests. 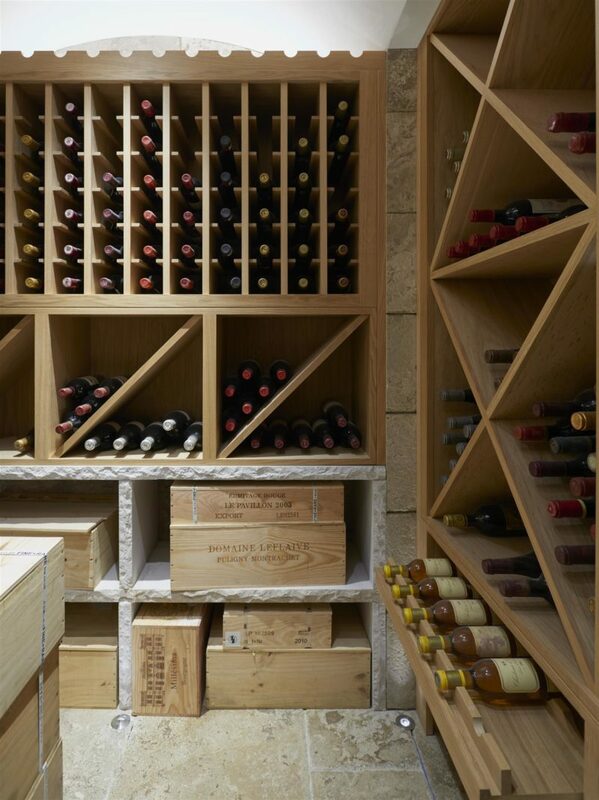 At McCarron & Co over the last 12 months we have seen a sharp rise in the demand for wine rooms and as bespoke designers we love the challenge of combining design aesthetics with practical and functional requirements. 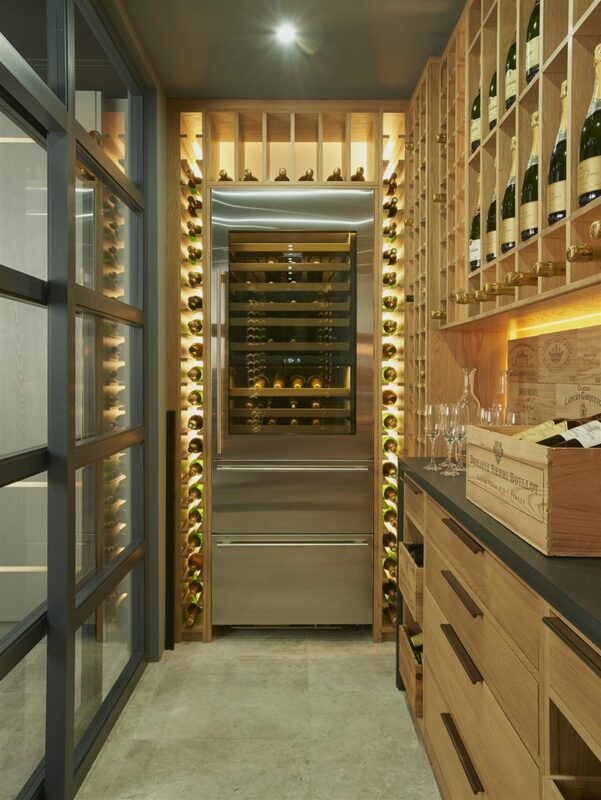 When considering incorporating a wine room to your design, firstly think about how much space you are willing to invest. If you are limited on floor space, perhaps think about a wine conditioning unit which can sit within a feature furniture piece with built in storage for wine glasses. 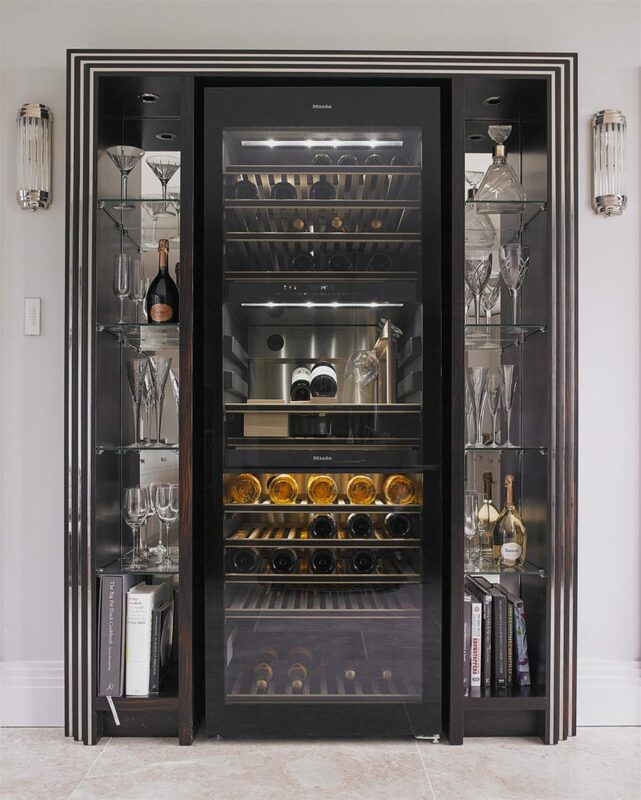 This art-deco inspired piece below houses a Miele wine unit with a feature surround of metal stringing inset into a Macassar Ebony frame. This elegant drinks cabinet was designed to create a feature area within a games room and is a real statement piece which offers a perfect solution in place of a separate wine room. If you are lucky enough to have the space, then you can create ‘zones’ within an existing room such as the kitchen or the dining room. One of the ways to successfully create a wine room ‘zone’ within an existing space is to use glass partitioning walls to section off the area allowing the space to feel autonomous whilst also integrating into the surrounding areas– a wonderful way to create a feature display of your prized collection which also serves as an alluring invitation to guests when entertaining. This striking McCarron & Co wine room in the photos below uses bespoke timber framing with inset glass panels to create a zoned off area with an industrial-like feel. The clever feature lighting draws the eye to the display and a set of oak drawers with a slate worktop is a practical use of the space. As this particular space was not temperature controlled, we installed integrated wine storage by Sub Zero which uses a whole host of technologies protecting the wine from light, heat, humidity and vibration. This particular model (ICBIW-30R), which has storage for up to 86 bottles, offers three independent temperature zones and has been designed to sit flush within the surrounding cabinetry. 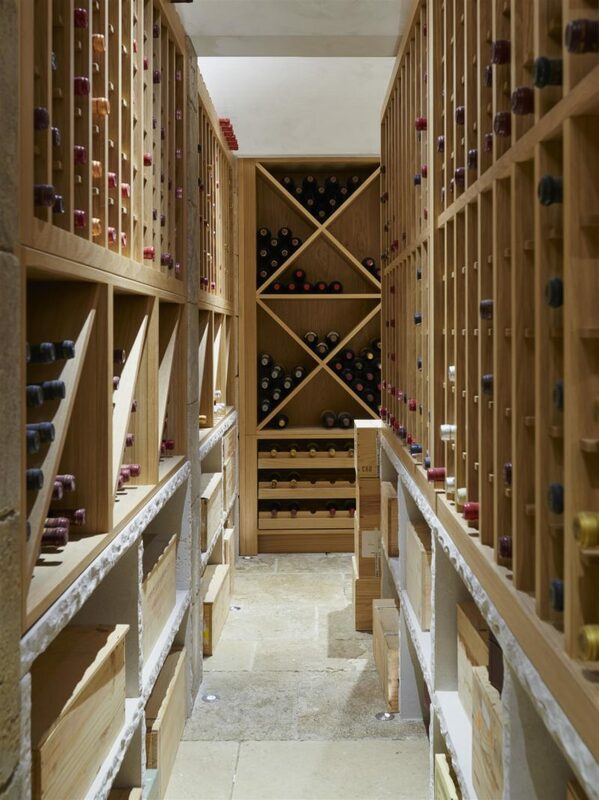 If you are wanting to create a more traditional wine cellar for your collection, and have suitable storage space, then a custom-made wine racking system is a perfect solution for making the most of every inch of space. In this Somerset-based project below, McCarron & Co designed and built this impressive wine cellar to house the clients substantial wine collection and pared beautiful oak wine racking with a raw-edge limestone worktop to fit seamlessly within this period property. Cleverly designed lighting highlighting the curved ceiling and uplighters in the floor meant that this space could be kept light and airy, a welcoming space in which to sample some of the finest vintages.